EDINBURG — Speaking to a group of Edinburg North High School students here, acting Texas Secretary of State David Whitley urged the importance of voting, which came at a critical time during both his career and the Rio Grande Valley’s current political climate; both of which have been under strain. The Edinburg school district hosted Whitley at the campus’ Performing Arts Center to encourage students to register and vote. He relayed his own experience of when he registered to vote as soon as he was of age, and has exercised that right ever since. 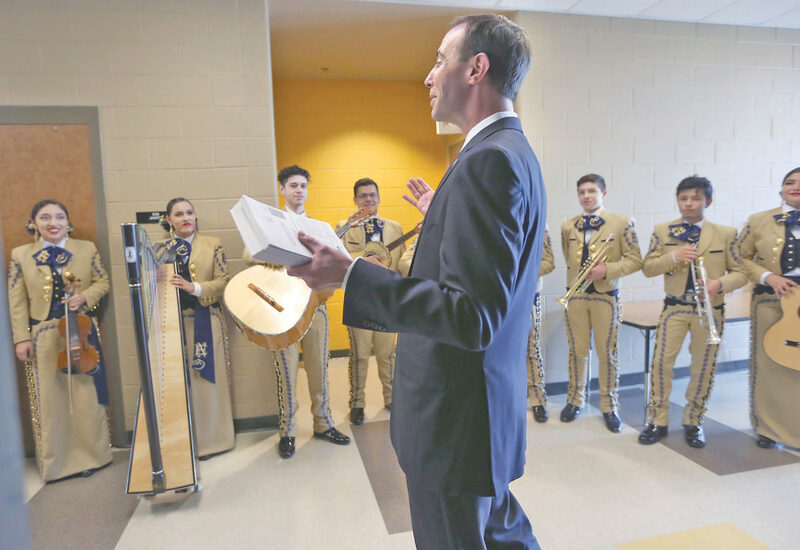 The school’s mariachi band greeted Whitley as he met with students and school district officials. Keeping the important things in mind is necessary for voters, he said. Government duties and family ties brought Whitley to the border, he said. His family hails from various cities within the Valley, such as McAllen and San Juan. He also acts as the governor’s liaison to Mexico, visiting about seven international bridges in the last two months to facilitate the relationship between the state and its southern neighbor, he said, adding that trade between Texas and Mexico amounts to about $200 billion a year. Whitley also spoke of identifying a passion that will motivate and shape how one votes to play their part in the democratic process. But locally, controversy regarding multiple voter fraud arrests has tainted that process in the same community that hosted him Friday. The Texas Attorney General’s Office together with the Texas Rangers arrested 15 people in connection with alleged voter fraud in the 2017 Edinburg municipal election, with the first five arrests made in May 2018. Whitley himself has faced controversy after his office issued an advisory in January claiming that as many as 95,000 “non-U.S. citizens” were registered to vote in Texas, which led to an unsuccessful voter purge that drew heavy criticism. The secretary of state’s office later walked back its allegations after it was discovered that many of those flagged were in fact citizens; now congressional Democrats are investigating Whitley’s voter purge. “We will fully comply,” Whitley said when asked about the probe on Friday. “We have absolutely nothing to hide. We [will] read it thoroughly and make sure we turn in everything over as required by law.